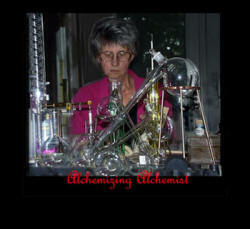 We are scientists that have had a lifelong passion for the sciences third only to our family and society. We have a combined experience of over 70 years at senior level participation in basic and applied research in physics and chemistry. · We generated funding for our research work in physics and chemistry through the competitive bidding process and were awarded contracts; from foundations and institutions such as the Oak Ridge National labs, NASA, the Air force, Army, Navy, NSF contracts and grants from historical foundations ,and museums. · We have published over 60 papers, talks, and more than 30 government reports. 18 U.S. patents not including foreign patents, some 22 proprietary manufacturing processing and the highest company technical awards, coauthored two books on plasma physics, contributed to books and pamphlets in the history of science and engineering , Galileo's telescope, early microscopes, Edison, Bell, etc..
· Rhoda has worked more than 30 years in chemistry and physics, 6 years in basic research in high temperature chemistry, 24 years in chemistry and manufacturing of photographic products. 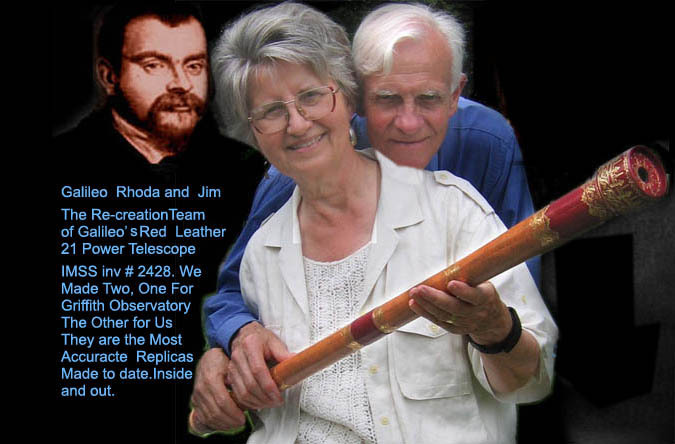 For the last several years Rhoda has taught college chemistry and co-owned a business with Jim collecting, buying and selling scientific and engineering works of Art. · We also work with the Media as science advisors and as a source of antique instruments of science and engineering for TV shows (NOVA, Discovery, and science channels etc.). We work with authors of books and articles on the history of science and with designers of science displays in museums, . · When instruments are not available we make them. We also help the actors, directors, producers, and crew learn how to operate the instruments used in the various scenes.. We have well-equipped machine and woodshops and modest chemical and electronic facilities. o Click on photo above to make it larger. This photo is of one of our early laboratories with the apparatus we used in our plasma physics and high temperature chemistry work for NASA and the U.S. Air force. We were doing basic research studies on electron transition of the outer orbits of atoms and negative ions. These data were used in the design; of the Apollo and Shuttle heat shields, lasers, energy transfer studies in the outer atmospheres of the sun and stars, the development of commercial and medical light sources, the studies of lightning, and A / H bombs, fire ball growth. 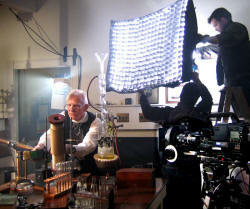 Later on all of this work was exceedingly useful in improving and creating new and better lighting devices. See list of patents below. ( light bulbs ) etc., etc. This photo is of one of our early laboratories with the apparatus we used in our plasma physics and high temperature chemistry work for NASA and the U.S. Air force. We were doing basic research studies on electron transition of the outer orbits of atoms and negative ions. These data were used in the design of the Apollo and Shuttle heat shields, lasers, energy transfer studies in the outer atmospheres of the sun and stars, the development of commercial and medical light sources, the studies of lightning, and A / H bomb fire ball growth. later on all of this work was exceedingly useful in improving and creating new and better lighting devices. See list of patents below. ( light bulbs )etc., etc. o We now have turned our energies toward helping people appreciate and learn more about the significance and beauties of science, its older scientific apparatus, its experiments. We are presently working on expanding methods of teaching a particular part of science.--that is -- encouraging a revolution in outlining the safe guards scientist have had to create and continue to create to insure the reliability and accuracy of their data and conclusions. We firmly believe the scientific community needs, especially the teaching aspect, to reach out more vigorously by advertising using rational emotional techniques the nature of how scientist cross check their data and conclusions the they reach. Some readers will point out that It is already being done teaching the scientific method.. Nevertheless there is strong evidence (note) that it is not being absorbed enough by the average citizen using this traditional approach. Most of the people are just not getting enough of the picture of how science checks itself to help science move on at the rate that is needed. o Last but not least We are trying to find better ways for encouraging everyone to support stronger funding for basic scientific research..
We are very grateful to have been part the award winning project "Forgotten Genius"
"Forgotten Genius" A film that, the authors acted as technical consultant for , was named the winner of the 2007 Science Journalism Award by the American Association for the Advancement of Science. 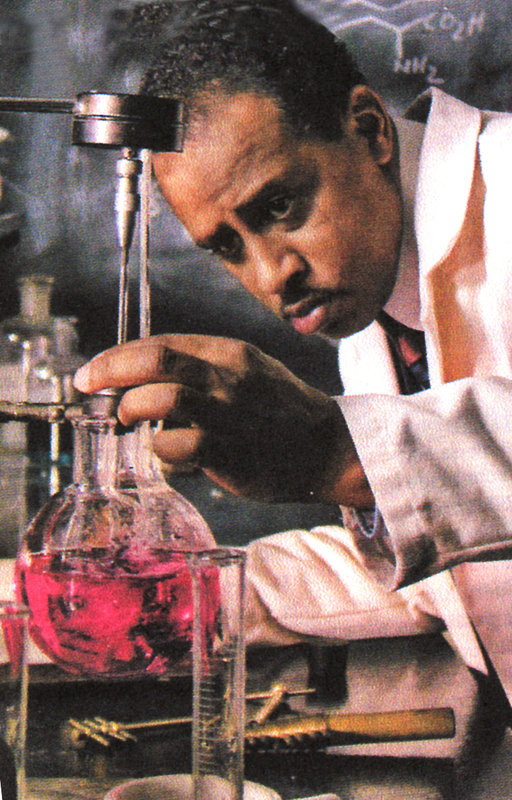 The AAAS award is one of the highest given out in the world of science television, so this is a great honor for the Percy Julian film. 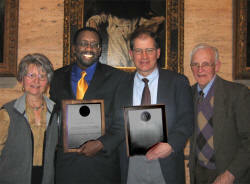 Llewellyn M. Smith, Stephen Lyons co directors of the film Forgotten Genius holding the award plaques received at the AAAS annual meeting in Boston in February 2008. They are bracketed by Rhoda and Jim Morris technical consultants on the film who furnished, most of the period instruments and chemical experiments for the laboratory scenes. We also made every effort to contributed our experience of the actions reactions of not only the chemistry but the drama of scientist as they are carrying out their work. To the left part of the support team working of the Julian film taking a short break to celebrate Rhoda's birthday on the set. Santiago- Hudson stars as Percy Julian in "Forgotten Genius." It is one of the very few films which gives a very accurate and dramatic portrayal of how science and scientists in the laboratory really work. It shows the competition, the funding ,and why scientist can’t lie about the data that they present in the literature. There are many tense scene dramatizing how very hard scientist work to find errors in there and other scientist's work and why it is very personal one on one issue to be the rightest and the firstest while the rest of the scientific community gobbles up your data in the next rush of being the rightest and firstest in the next step of discovery. 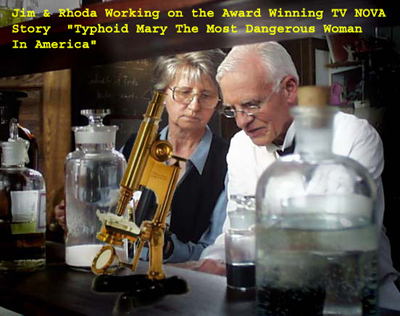 Rhoda and Jim under the co- direction of Llewellyn M. Smith Llewellyn M. Smith, Stephen Lyons participated vigorously in the laboratory set ups furnishing the equipment the experiments and advice of the scientist emotional response during the dramatic ups and downs that scientist experience as they push themselves and their equipment to the limits to be right and to be first in the discovery process. Below some random foots showing a bit of the cross-section of the work and projects we do. We have built two of these beautiful instruments. 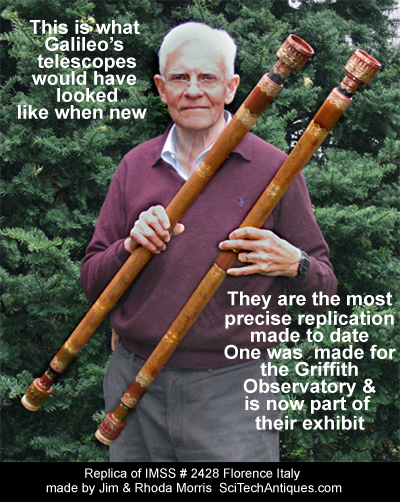 One goes on exhibit at Griffith Observatory October 2006. The other served as a prototype and backup during the building process. Each has nearly 100 parts and over 400 hot gilded stampings. It has taken upwards 1200 man hours of research and shop time to build them. Tolerances are within approximately 1.5 % of the original, most times closer both inside and outside. They are total replicas. Jim & Rhoda setting up the labs and experiments for a TV show called "The Prophets of Science Fiction". It reenacts scenes about Jules Verne, HG Wells, and Frederick Soddy a Nobel Prize Chemist, and demonstrates how both science fiction writers were ahead of the scientists of the day! Rhoda above is setting up the chemical apparatus and Jim on the left is setting up a spectroscope for elemental analysis while the set crews put up camera and lighting equipment. Jim has been dressed up in an 1860 outfit as a stand in! Rhoda & Jim re-enacting lightening! 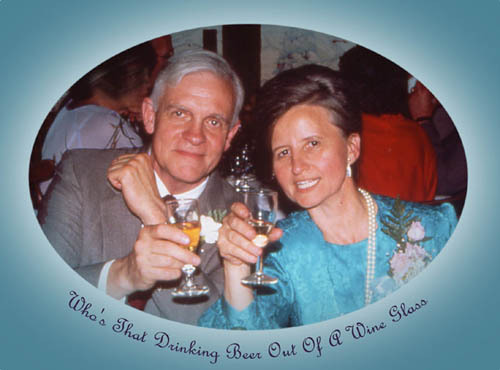 Below Follows a Detailed History of Jim and Rhoda's Professional Experience in Science and Engineering Including a Selection of Papers, Books, TV/Movies, Patents and Professional Societies. 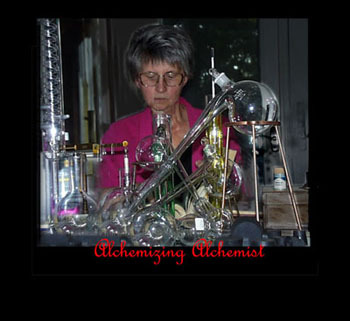 Prior to Rhoda's current co-ownership of "Antiques of Science and Technology" with Jim and teaching college chemistry at community colleges, Rhoda's career spanned from chemical research and development to a technical and business career in photographic chemistry. At Avco Corporation in Wilmington, MA she worked on synthesis of ablation materials for re-entry vehicles, followed by basic research in plasma physics (described in more detail by Jim below). In her early career at Polaroid Corporation, Rhoda was Chemical Analytical Development Group Leader for the integral film division in the development of dye, silver and polymer systems in instant photography products. 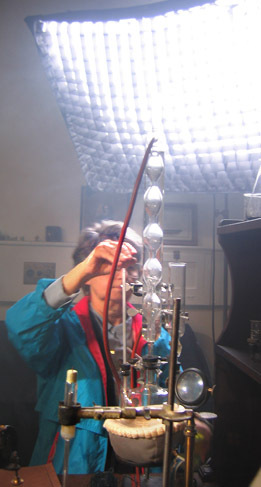 Besides her contributions at AVCO where she co-authored a series of papers on high temperature radiative properties of atmospheric gases, further discussed below, her technical achievements at Polaroid included studies of photographic mechanisms, stabilizing gelatin based intermediates against bacterial degradation, and characterizing fine chemicals used in dye, addenda, and polymer systems. These included establishing processes in photographic media such as gelatin/aldehyde cross-linking using infrared spectroscopy and viscosity techniques and characterizing solvent addenda on dye developers by thermal differential scanning calorimeter - the latter yielded important links of these states to changes in dye transfer rates in the photographic negative. In her business and manufacturing responsibilities Rhoda concentrated on new product introductions and eventually on business practices and turnaround efforts. As an example of a major achievement, she led a cross functional team in an eighteen month program to manufacturing excellence through a supply chain management initiative. This effort improved customer deliveries to 95%, reduced inventories and production cycle times by 50% for a $40mm industrial coating and chemical mix plant. Team members included operations, materials, engineering, finance, program, and training group leaders. These improvements were driven by extensive staff and plant member training in MRP (Manufacturing Resources Planning) practices. Since leaving Polaroid Rhoda has been teaching college chemistry and working with Jim in their business "Antiques of Science and Technology". See below for a description of their activities in this joint venture. Jim's research work had been sufficiently original, timely and useful to permit him to be elected as a member of the executive committee for the American Physical Societies Gaseous Electronics Conference and to be voted as the chairman of the Arc Symposium Committee. Jim also had been included as one of the participants in the Department of Air Force's Data Exchange Agreement made between the German Ministry of Defense and the Department of Defense U.S.A. Every major university and research laboratory in this country and overseas doing serious work in plasma spectroscopy had asked to be put on his distribution list for reprints and papers covering his research or requested individual reprints. 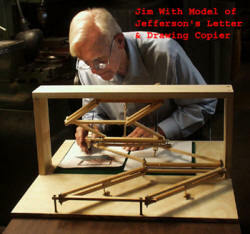 Jim was a reviewer of scientific papers for the Physical Review, Journal of Quantitative Spectroscopy and Radiative Transfer, Review of Scientific Instruments, Journal of the Optical Society of America, Journal of Geophysical Research, the American Institute of Aeronautics and Astronautics, and Applied Optics. Jim has authored and coauthored proposals to government agencies outlining research work sufficiently original and well planned to be awarded 10 million, current, dollars worth of contractual work over his career. Jim: Illinois Institute of Technology. 1955 to 1959. Research assistant - Assistant Physicist. Jim worked as the project leader in the Optics section where his activities centered around planning and performing experiments to measure the thermal radiation properties of metals and dielectrics. Specifically these measurements were to determine the total and spectral emissivity and solar absorptivity. Jim designed and operated equipment to measure the spectral and total emissivity’s for temperatures from the boiling point of liquid nitrogen to the melting point of the material under study. He also made measurements of the temperature dependence of the complex index of refraction of tungsten up to 2000°K. He contributed to infrared guided missile programs where the interest was in building target simulators, also in counter measure efforts studying short lived pyrotechnic flares. Through these projects Jim gained a substantial background in physical and applied optics, and visible and infra red photometry. Jim: University of Chicago. 1959 to 1961. Staff member. At the Laboratories for Applied Sciences, Jim directed the efforts of 15 to 20 professionals, technicians and machinist and carried out spectroscopic diagnostic studies of the plasmas that were being used for material evaluations and MHD devices. Initially, these studies were temperature measurements and evaluations of conditions of equilibrium. Jim was later responsible for the study of a magnetically collimated arc which was identical to the type used in the DCX thermonuclear experiments at Oak Ridge. The goal for this project was to reach an understanding of the "Physics" of this type of arc and to obtain a sufficient amount of information about individual arcs to allow a proper selection of one which would be most suitable for the DCX project. This work included measuring the translational and thermal velocities of the ions in the arc column with line shifts and shapes. Jim evaluated the excitation temperatures from line intensities, determined the electron and ion temperatures using Langmuir probes and made mass spectrometric determinations of the density ratio of the various ions present. 'While at the university, Jim continued some emissivity measurements begun at Illinois Institute of Technology. These studies were made for heat shield materials of space reentry vehicles. 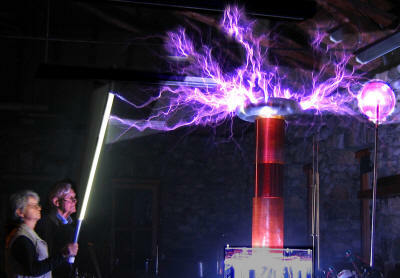 Jim also did some arc electrode development work for high powered electric arcs. Group leader Plasma Physics brought in contracts from the Air force to look at the continuum and line radiation in the vacuum ultra violet. The production of a Mercury laser for the green portion of the spectrum. The electrical conductivity of Mercury. Jim developed a radiation standard for the vacuum ultra violet using end on constricted electric arc technology. Jim: General 'Telephone & Electronics Corp. for the industrial / commercial division Lighting division 1972 to 1993. Jim joined GTE Sylvania in 1971 as an engineering specialist in the physics laboratory at Danvers headquarters. Jim was appointed senior engineering specialist in 1972 and manager of the engineering, computer and math department in 1974. In 1975. 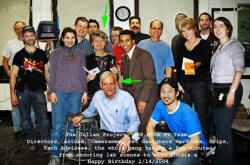 Jim became manager for the new product support laboratory in Danvers headquarters In 1979 Jim was appointment as manager of new Product Development Group for the General 'Telephone & Electronics Corp. for the industrial / commercial division Lighting division. Jim was awarded more than 18 U.S. patents, won the highest company award for technical achievement, including dozens of new products and major improvement of processing and manufacturing. In staff development Jim's teams won major company awards for their contribution to the product lines. Rhoda and Jim have ten years of experience as technical consultants and advisors to the media filming business on science related movies, books and television projects. We furnish and or build props, assist in the development of experiments, and train personnel in the operation of equipment and conducting technical experiments. 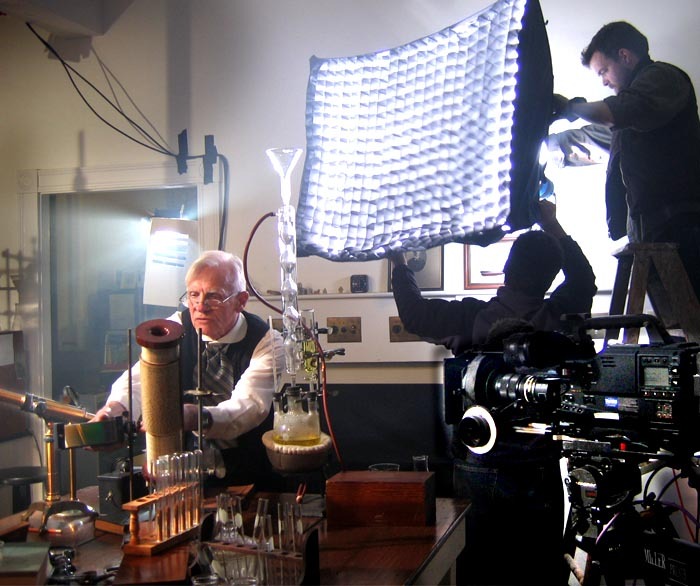 A major interest and concern of our work is to assist the director, actors and staff to produce accurate as well as interesting science scenes and enactments for their program. In the past 35 years we have developed a collection of over 2000 historical instruments, artifacts of science and technology. Our resources also include a laboratory for conducting chemical, physics, and electronic experiments. We have a very complete shop for wood, glass, metal, and electronics fabrication and testing. Using his extensive experience in constructing experimental apparatus and product prototypes in 40 years of R&D, Jim has developed skills in restoring and replicating historically significant scientific instruments and devices. Our large number of diversified instruments, the knowledge gained in researching their history, a replication, fabrication and testing capability, and our 40 years of professional experience in science and industry enable us to offer what we believe is a valuable resources for the media in filming science and technology subjects. Bulletin of APS Series II, 2_, (1957). INTEGRATION, JOSA 47, 1048, (1957). OF PLATINUM, RHODIUM, AND PALLADIUM, JOSA 4J, 1052, (1957). GASES, LIQUIDS AND SOLIDS, ASME, (February 1959). DIELECTRIC MATERIALS, JOSA 4j?, 509, (1959). the Chicago Optical Society, (May I960). RADIATION SOURCE, JOSA , (l96l). 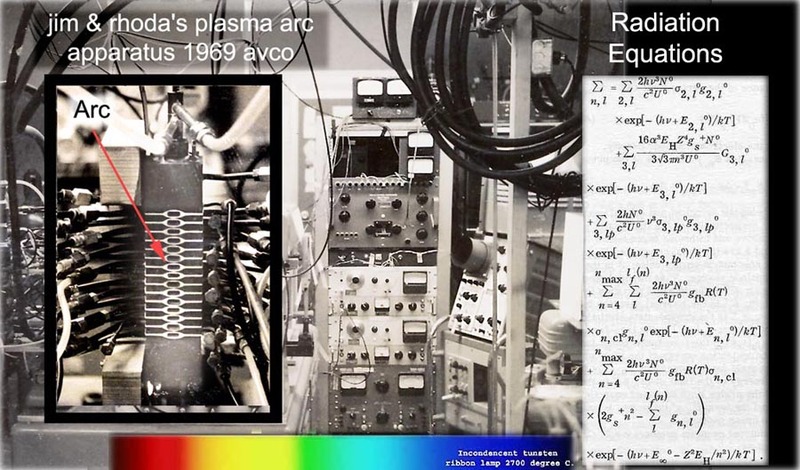 ARL Plasma Arc Seminar, (September 1962). of Plasma Physics Section of the APS, (November 1966). Laboratories, Pittsburgh, Pa., (Spring 1967). NITROGEN, OXYGEN, AND ARGON PLASMA, Final Report, ARL 68-0103, (May 1968). IONIZED NITROGEN, Phys Rev. Vol. 100, 1&7, (1969). at Gatlinburg, Term., (May 1968). at the Gordon Conference on Spectral Line Shapes in Andover, New Hampshire, (July 15-19, 1968). NITROGEN OXYGEN, AND ARGON PLASMAS, Phys. Fluids, (June 1970). With R. U. Krey(Morris), ARGON CONTINUUM RADIATION, JQSRT, 9-1633, (1969). 0I AND NI, Phys. Rev., 5-112, (1969). TEMPERATURE OF ARGON CONSTRICTED ARCS, JQSRT. 9-1629. (1969). CONTINUUM OF ARGON FOR THE 20000°K TO 30000°K TEMPERATURE REGION. PULSED CONSTRICTED ARCS. Rev. Sci. Inst. 5_, 661 (1970) . presented at Arc Symposium. Gatlinburg, Tenn., (October 1969). APPLICATIONS, Rev. Sci. Inst. 41, 877. (1970). ARL Final Report. ARL 70-0038. (January 1970). (Second Arc Symposium) 23rd Annual Gaseous Electronics Conference. Conference, London, Ontario, Canada. (October 1972). J. C. Morris and J. H. Walker, "Electron neutral Transport Cross Section of Mercury,"
J. Appl. Phys., V 44, No. 10, (October 1972). to Fluorescent in the Home Market", Ltg. Design and Appl., (March 1978), P 18-23. SHIPS, American Modeler. (May 1959) . LATHES. Popular Science. Spring 1971. Experiments for Educational Television Requirements. Alexander Graham Bell's 1881 efforts to help save President Garfield's Life (for the Japanese TV). 2003 Eden Entertainment Limited, Inc.